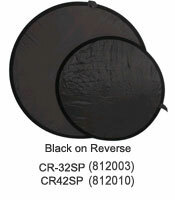 Each kit includes a reversible wrap that can be zipped around the diffusion panel. One combination has a bright white surface on one side with a warming gold on the other. This wrap can be reversed to expose the black and high contrast silver panels. in 22", 32" and 42" sizes. For larger jobs, we offer the 42" x 72" rectangular kits. spring frame, zip around reversible wrap and travel pouch. 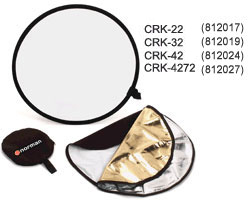 The "Touch of Warmth" reflectors by Norman have become very popular with portrait photographers. The unique checked pattern provides the distinctively warm, pleasing flesh tones that can only be achieved with this reflector. Available in 32" and 42" sizes with a black panel on the back, the reflectors are collapsible and come with a convenient travel pouch. A Universal Reflector Mounting Arm URMA (812731) is the best way to be sure your reflector or diffusion panel is in a position that will give you the best possible effect. 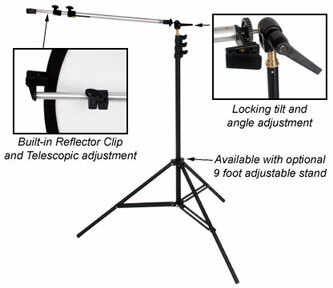 The mounting arm can be set to accommodate various reflector sizes, and it can be adjusted up, down and at an angle. Available alone or with a 9' stand LS222-URMA (812262), the reflector mounting arm is designed to attach to the threaded top of a 5/8" light stand mounting post.